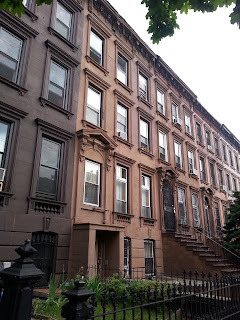 Dean Street between Franklin and Bedford is one of many idyllic, brownstone-lined blocks in Crown Heights. On summer evenings, kids roll along the sidewalk on scooters and residents linger on stoops, chatting as the daylight wanes. Like much of the neighborhood, it's a mix of old and new, and the hallmark contrasts of gentrification are easy to spot. But the block retains a friendly feel in the face of change, thanks in large part to an active block association and community garden where longtime locals have welcomed newcomers into the fold. Behind the brownstone curtain that lines the street, however, all is not well. Crown Heights, as you've surely heard, is experiencing a real estate boom, and according to one neighbor who works in the industry, offers on brownstones have begun to far outstrip bank appraisals of the same properties. The market that results from this discrepancy between appraisals and offers favors those with cash on hand for massive down payments; not families or other owner-occupiers, but developers. It comes as no surprise, then, that 1076 Dean Street, an 8-unit, rent-stabilized brownstone in the middle of the block, sold for $850,00 recently, not to a young couple but to "1076 Dean LLC." What is surprising to local residents is the lengths to which the new owners have gone to chase the existing tenants out of their apartments, including one senior citizen on a fixed income. Things became clearer when one neighbor spoke to a broker who came by to see the building earlier this week, reporting that it's being re-marketed for $1.5 million. Empty. Maintenance ceased almost immediately after the sale, and now garbage piles up in the front and back yards as leaks drip away unplugged. Though the new owners' goal is to vacate the building, three new tenants moved in. Two of these tenants let their massive dogs roam the building's hallways, urinating at will, while they throw trash out their windows and host parties with music blaring at all hours of the night. The third tenant, a older man who can often be seen speaking with one of the new owners outside the building, plays good cop to their very bad cops, strolling around the building commiserating with the tenants about the deterioration of the place and then casually mentioning that he knows the owner and thinks they could work out a buy-out. Under this kind of pressure, a few tenants have thrown in the towel, but for those with limited or fixed incomes, a buyout that promises to pay half of the security deposit and first and last months' rent in an unstabilized apartment (which is what's reportedly been offered, so far, roughly $3,000 dollars) is a terrible deal. Concerned neighbors have called 311 in an effort to reduce the noise pollution and get the landlord to clean up some of the garbage, and have referred the tenants to housing rights advocates and lawyers. Their efforts seem to have reduced the brazenness of some of the owners' behavior, but the legal process is a slow one, and forcing landlords to take responsibility for the bad behavior of tenants is even harder. Being appraised of one's rights is a good thing, but it's hard to hold out for a better day when you have to dodge dog urine on your way into your leaky apartment. One neighbor with experience in real estate has suggested that the developers buy out the tenants with offers of lifetime, fixed-income leases comparable to the current leases in other apartments the developers own. Such an offer can work for everyone - the developer gets to redevelop one property and has an appreciating asset stowed away, as such leases can be negotiated to expire when the original tenant leaves - but a compromise of this sort seems unlikely. Sadly, this kind of behavior is all too typical in overheated real estate markets like Crown Heights (a similar situation on Franklin was documented this past January in the Narratively article "The Ins and the Outs"). The developers who have cash on hand to buy these properties have a very different relationship to the neighborhood than the owner-occupiers paying thirty year mortgages nearby, and it shows in their treatment of their tenants and their buildings. Intimidation tactics are frightfully common in every borough, and the 1076 Dean LLC folks are likely well-schooled in them, as they share an address with Maspeth Development LLC, a firm that's been destroying the St. Savior's Church property (cutting down trees, demolishing buildings, etc) against the wishes of Middle Village residents for the past decade. What's to be done? As discussed at the most recent CHCA Town Hall, knowledge is the first step, and NYU has put together an excellent compendium of resources here. The Crown Heights Assembly's Tenant Union, which meet this Saturday in Brower Park at 1pm, is also working hard to bring awareness to these issues. In many cases, though, time is on the side of the absentee landlord, not the suffering tenant, even when tenants use every legal channel available to them. Folks in this position need community support as well as legal support, to know that theirs are not isolated struggles. Building awareness of these conditions, and vocal support for the the rights of those who suffer under them, is not a solution, but it is a place to start. Great post, really an awful situation; thanks for keeping us informed, it is really so important. Oh my gosh, so that is what is going on over there... I've been wondering about those sketchy folk loitering in front of their building - loud as hell, even at 3 am at night. Stay strong, remaining tenants. So sorry to hear about your situation. Those sketchy tenants won't get "fixed" by the developer, but the block banding together. Can this be addressed at the next block association meeting? Wow. Professional thuggery contracted in by scumbags. Sounds like they know all too well that the City is too clumsy to be able to do anything about it. Chasing your LLC links a little deeper, Nick, looks like these guys http://kdhllc.com/ are behind it all. Thuggery is how some like to describe the interim tenants, but often they are merely unscreened tenants with bad credit who are so desperate for a place to live that they will take an apartment without even a month to month lease. The LL, of course, is willing to take some money over no money for the period that the building is being vacated and sold, and the fact that the interim tenants look scary to the older tenants is (at best) an unintended happy side effect. Gentrification is not pretty for everyone, and creates situations in which a lowly tenant has to decide what (if anything) they are going to do against a much larger force. When you look at the profits involved, it is easy to understand it. Nope, they even spend part of the week "working" on a different building in Bed-Stuy. And the building is being pitched to brokers for 1.5 million, delivered vacant. This is their core business. Absolutely disgusting - is it possible these interim tenants were intentionally sought out & installed by the new owners to intimidate the longtime residents - with the promise of some "bonus" after their nefarious goal has been achieved? Perhaps it sounds paranoid - but I wouldn't' discount anything when it comes to this. This landlord needs to have the pulp in his bean examined. On occasion, relationship between the Interim tenants and the owner is long term in nature. Meaning that once a building is ready for renovation (or sale as empty), the owner is able to move them into a new building that they (or someone they know) owns and is going thru a similar process. Needless to say, this provides a series of homes for people who may otherwise be homeless (they are at the bottom of the tenant food chain), and makes them like the owner. If confronted, the owner can state they are housing these folks out the generosity of their heart and for very little money, and no one is able to show otherwise. There is another piece to this puzzle. The bank appraisers are purposely low balling the appraisals on these properties so that the people with cash are the only people who can buy. If you check out who the bank appraisers are, and who the people with the cash are, I'm sure you will see the connection. We bought a house 7 years ago and have put a lot of money into renovations. We recently refinanced. The bank's appraiser said the building was worth $100K LESS than when we bought it. In today's market, it is not true the building is worth less than the unrenovated wreck we bought 7 years ago. But what is true is that we could never sell it to somebody who needs a loan, because the appraisers are working a different group. We have no intention to sell because this is our home. But there are a lot of elderly home owners on our block that won't have any choice but to sell to the people with the cash. This scam has been going on in this neighborhood for a very long time. This is a great post, Nick. Have they tried getting local politicians involved? Or perhaps one of the many people clamoring to be mayor? If they've already gone to tenants' rights organizations there may not be much more that the politicians can do, but who knows, maybe they have some pull in the right area. Dogs can be poisoned, you know. [Says this owner of 8, throughout her life]. No reason to not be obnoxious right back. I'm not sure if you have lived in NY long enough to watch other NY neighborhoods change, but what is being described is the process that neighborhoods like Park Slope and the Upper Westside went through. They didn't always have the demographics that they do now. The same laws were in effect, and the same techniques were used to increase the revenue of the buildings. The building's records indicate that there are 8 class 'A' units in the building. It also has 15 violations on the building and electrical work was done, with a permit, and never signed off. With these violations and other work done without a permit and inspection by the Department of Buildings should be done as soon as possible. Um, you know that isn't considered a big deal, right?